Beta-keto carboxylic acids undergo decarboxylation through ring formations. The carbonyl bond of the ketone will react with the alcohol group of the carboxylic acid to form a ring and release the carboxylic acid as CO2. The remaining enol will tautomerize into a carbonyl group again, leaving cyclopentanone. Notice a cyclopentaldehyde can’t even be a possible answer, aldehydes cannot exist in cyclo compounds. Adding acid or base to a mixture of unknown compounds is designed to change the water solubility. The loss or gain of protons will make the compound become ionic in nature, and thus soluble in water. On the other hand, compounds that are already ionic may become neutrally charged, resulting in lower solubility in water. 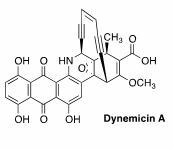 Dynemicin A (pictured), a potent anti-tumor antibiotic produced by Micromonosporachernisa, is a potential lead compound in anti-cancer research. How many pi (π) bonds does Dynemicin A possess? Dynemicin A has two aromatic systems, three carbonyl substituents (two ketones, one carboxylic acid), two alkenes and two alkynes. Total = 15. Recall that alkynes possess two pi bonds in addition to one sigma bond, therefore C is not correct. 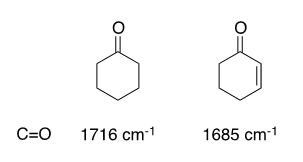 What is the major product of the following reaction? E. The reaction produces mixtures of all four. The bromonium ion is formed when alkenes react with bromine. When the π cloud of the alkene (nucleophile) approaches the bromine molecule (acting as an electrophile), the σ-bond electrons of Br2 are pushed away, resulting in the departure of the bromide anion. The species formed is a high-energy intermediate along the reaction path. It will react further with some nucleophile−methanol in this case. The electronic structure of the bromonium ion has its consequences in the stereochemistry of the reaction. Nucleophilic attack takes place from the bottom face (back-side to the “departing” bromide) on the more substituted carbon. The back-side attack leads to the anti addition (Br and Nu groups end up on the opposite faces of the starting double bond), and the nucleophile adds to the more substituted carbon (Markovnikov’s rule). Structure III corresponds to the above. Structure II may form, but only in very miniscule amounts. What reagent can be used to convert 2,2-dimethylbutan-1-ol into 2,2-dimethylbutanal? The conversion of 2,2-dimethylbutan-1-ol to 2,2-dimethylbutanal is an oxidation (alcohol -> aldehyde). Lithium aluminum hydride (E) is a strong reducing agent. Potassium permanganate (C) is used in the oxidation of alkenes to diols, and is generally not strong enough to further oxidize aliphatic alcohols. Ozone (D) is used in the oxidative cleavage of alkenes into the corresponding aldehydes or ketones. Chromic acid (A) is a harsh oxidant, oxidizing primary alcohols up to the corresponding carboxylic acid, and secondary alcohols up to the corresponding ketone. PCC (B, pyridinium chlorochromate) is a milder chromium-based oxidant used in the selective oxidation of primary alcohols to aldehydes. 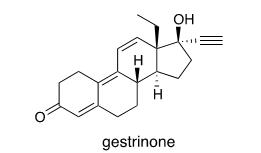 Gestrinone is a synthetic steroid hormone that is marketed as a treatment for endometriosis. What is the index of hydrogen deficiency (IHD)–or degree of unsaturation–for gestrinone? 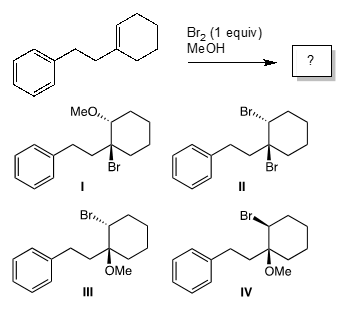 Which one of the following reactions of alkenes does the Anti-Markovnikov’s rule apply instead of Markovnikov’s rule? The electronegativity of the hydrogen atom is stronger than that of boron, which means hydrogen is relatively negatively charged compared to boron. So in this case, the hydrogen will be added to the end containing more substituents and the boron part will be added to the end containing more hydrogen atoms, which will then convert to the hydroxyl group. This is the Anti-Markovnikov product. The absorption of what type of electromagnetic radiation results in electronic transitions? Ultraviolet–visible spectroscopy (UV-Vis or UV/Vis) refers to absorption/reflectance spectroscopy UV-Vis spectral region. The absorption or reflectance in the visible range directly affects the perceived color of the chemicals involved. In this region of the electromagnetic spectrum, molecules undergo electronic transitions. Molecules containing π-electrons or non-bonding electrons (n-electrons) can absorb the energy in the form of ultraviolet or visible light to excite these electrons to higher anti-bonding molecular orbitals. The more easily excited the electrons (i.e. lower energy gap between HOMO and the LUMO), the longer the wavelength of light it can absorb. The 1H NMR spectrum of an unknown compound shows the following signals: triplet, quintet and triplet (relative integrals 1:2:3, respectively). Which compound is consistent with this data?